I like updating our living space to match the seasons and I couldn't wait for spring to come as I was growing tired of all the red, faux furs and cinnamon smells around the house. Although I loved it in winter I'm so happy seeing flowers bloom, having lighter warmer evenings in the garden and sunnier days out. When we moved to our new home in August last year we decided to paint the walls white with the odd feature wall in the bedrooms but keeping the furniture quite neutral so that if we did get bored of the decor we could easily change it quite cheaply by just changing the soft furnishings. And this is what I do with the change of seasons, I simply pack away cushion covers, heavy blankets, wintry smelling candles and seasonal wall hangings and trinkets and replace with pieces that feel all spring like. Here are 5 ways to update your living space for Spring/Summer. Cushions - Bright colours are a favorite of mine at the moment and colourful cushions are the easiest way to inject colour into your home whatever your colour scheme. I prefer my cushions to be a mishmash of patterns and shapes but I try to keep to a few colours. My motto for cushions is the more the merrier! Candles - I love scented candles and burn them on and off throughout the day. Yes they are lovely for creating atmosphere in the evening but they also great during the day. I like to spend a little more and buy good quality candles. I think of them like perfume, you get what you pay for. Saying that TK Maxx always have a huge range of quality candles at discounted prices. I never buy the same scented candle, it all depends on my mood but at the moment I love this Thai Lily & coconut it reminds me of summer also the colour of the wax itself is gorgeous! Try to stick to scents that you love in Spring or Summer be it fresh lining hanging on the washing line or flowers. Flowers - flowers are a must, I buy a bunch of flowers each week and again they change depending on my mood but I prefer simple understated flowers and I try to make them stretch as far possible. I often pop some of the cuttings in a mason jar or interesting beer bottles and dot them around the house to add a bit of spring every where! If you prefer your blooms bright then this is another easy way to add colour to your home. Prints - As if I didn't have enough flowers in mason jars around my home I need prints of them too. 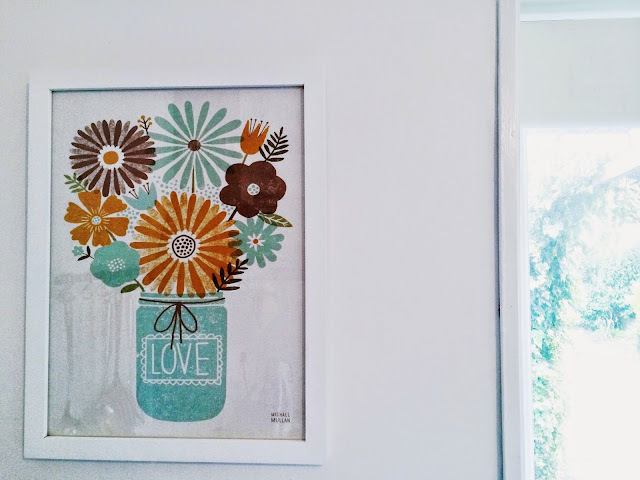 Colourful spring/summer themed prints can be cheap and easy way to add a bit of spring/summer to your home. If you're a creative type why not design and print your own. It doesn't have to be anything fancy what about some typography "Hello Sunshine" in a bright yellow font, simple but looks great when framed. Fireplace/ Display Units - Go crazy! I change what I display on the fireplace on a weekly basis. It could be a spring themed bit of art Tiger has made at school or a hand picked bunch of daisies Beaux has given me. I',m also a sucker for fairy lights no matter the time of year but these flower fairy lights look great during the day too and have a real feeling of spring/summer.